How a gay nerd won World War II. 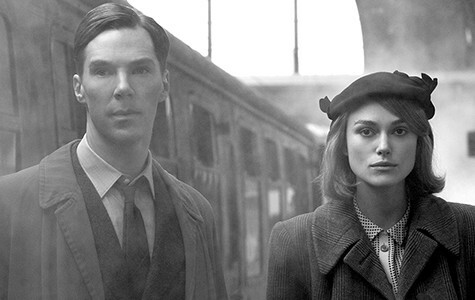 Benedict Cumberbatch and Keira Knightley star in The Imitation Game. Directed by Morten Tyldum. With Benedict Cumberbatch and Keira Knightley. Now playing. In The Imitation Game, Benedict Cumberbatch plays Alan Turing, an English mathematician and cryptanalyst who managed to crack Enigma, the German code-making machine, a breakthrough that led to Allied victory over the Nazis in World War II. Turing, who happened to be gay, is credited by many with being one of the founders of computer science. These accomplishments did not prevent Turing's postwar prosecution for homosexual acts (he agreed to "chemical castration" for his crimes), nor his eventual suicide in 1954 at the age of 41. But Norwegian international director Morten Tyldum's movie doesn't have time for much of that. It's a solid historical drama about someone who changed the world but is unknown today, told in the movie language of the decorous, tasteful, front-loaded, year-end-award-seeking film — an art-house alternative to noisy holiday entertainments. Busy character actor Cumberbatch (August: Osage County, War Horse) plays Turing as the classic auto-didactic computer geek, a crossword puzzle wizard unpopular with his mates, sort of a premature Asperger's success story. Turing spends 100 percent of his screen time looking worried. Equally overbooked actress Keira Knightley is tossed into the mix as a character named Joan Clarke, but her main contribution to the project is as a female face to put on the movie poster. Matthew Goode, Charles Dance, and Mark Strong also show up as British military/scientific figures. The development of the "Turing machine" is the chief bit of business, but the real story seems to be happening off-screen, in the epilogue titles. So winning World War II should rightfully take a back seat, dramatically, to Turing's humiliation at the hands of the government he helped rescue. Biographies don't come any more ironic than that.